So almost 6 months ago now I got the urge to take a dresser from my sister and refurbish it to fit into my middle sons bedroom. The dresser that I currently had or him kept falling apart and it did not seem to matter how much I continued to rig the darn thing, it kept finding other ways to fall apart. So when my sister was looking to get rid of one I jumped on my chance. This was an older dresser that had some damage to it over the years, but was going to be perfect to repurpose for his room. As you can see I immediately got my tools out and set to work. I forgot to take a before picture but this was pretty early on in the process. I had a screw driver to be able to remove the handles. Lucky for me I have an awesome 8 in 1 screwdriver that seems to be the handiest go to tool that I have used. It is light weight, but helped me in some heavy duty projects. Clearly this can’t be the ONLY screw driver to have around when you have bigger jobs since I am sure the little arm that holds each of the 8 sized screwdrivers would not hold up too much. But this is handy for the small to medium jobs. 8 in 1 lightweight screwdriver. I also have sandpaper here, as I was doing a decent amount of sanding the clear coat that was on the dresser off. This usually helps if there is gauges or scraps in the dresser. It isn’t hard to have some of those scrapes happen, but it removes fairly well during a process like this. The link takes you to my favorite sandpaper group when I work on these projects. Let me tell you now that I was never trained in the perfection of these projects, I seriously have only picked up a few things over the different projects that I have done. With furniture that has a good clear coat on it (most do) I always start with a rougher piece out of the bunch that come in those sets. The lower grit size makes it rougher, and the higher grit sizes are what you want to use after you have sanded down the majority of the original coat or two off. That’s the one that smooth’s it out enough to start painting. This is the what takes the most “elbow grease” out of the entire projects. Don’t let people fool you, it is hard to continuously do. I usually take one of the big sheets and fold it into fours, so that I can just rotate through them as they start to wear out. Once you have gotten everything to an evened out feel, with the majority of the scratches taken down to the bare minimum (if not gone altogether), you wipe it down. I use a dry microfiber cloth to be able to catch the majority of the sanding dust. You really want a clean surface when you start painting. 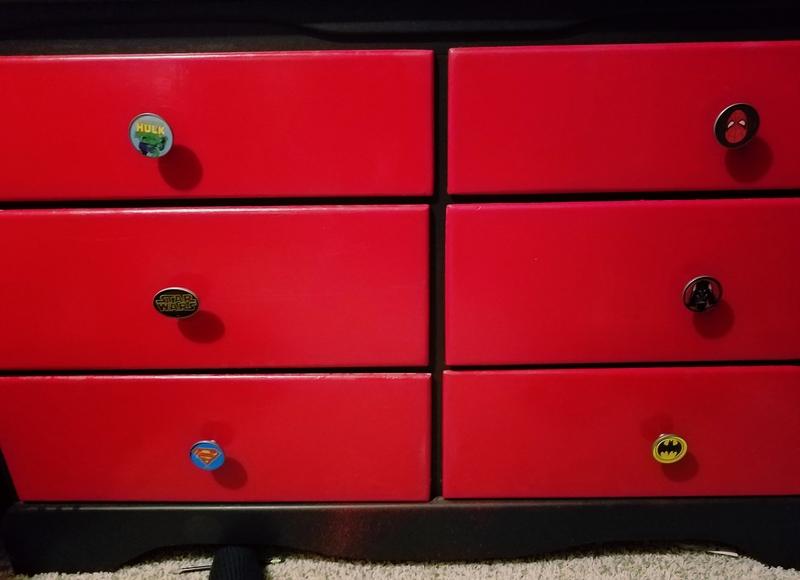 When I sat down with my middle son making plans for this dresser, he of course went in completely and asked for it to be a full superhero themed dresser. I asked him the colors that he would choose for it and he told me black and red. So after some looking I decided that I was going to spray paint it since it was two different colors. I wanted a flat black body, and shiny red drawers. I had seen some amazing drawer pulls at my local hobby lobby that had me thinking about how cool it would be if he could have a different character pulls for each drawer. I stuck with this brand for the flat black, apple red as well as the clear coat I used to top it. At the times that I was looking there were no options at all, prime or not, on Amazon for the drawer pulls but there is one now that I will add on here for your convenience. I had to go to my local hobby lobby where I still paid anywhere from 4 to 6 dollars for each one. I hate to tell you how many times I put these bad boys back and left the store without them before realizing that in the window of time that I was working on this, those were my only option unless I wanted to travel farther then my normal shopping area. What I didn’t get in my screenshot of the handles was that with this purchase it actually does have free shipping if you spend over 34 dollars. Convenient right? I absolutely love doing projects like this, but I have not always taken pictures of the majority of them. I will be better in the future with this so that I can share my successes, and maybe even some of my fails. You don’t scare me anymore swimsuit weather!